I'm excited to show you some of the things I made for a recent Craftster swap. I tried this tutorial for hand-bound journals about a year ago, but then I forgot about it... Just rediscovered it for this swap, and it's so much fun! I embroidered my partners initial on the cover fabric to personalize the journal. I used nice white paper for the signatures and a sparkly blue scrapbook paper for the end papers. 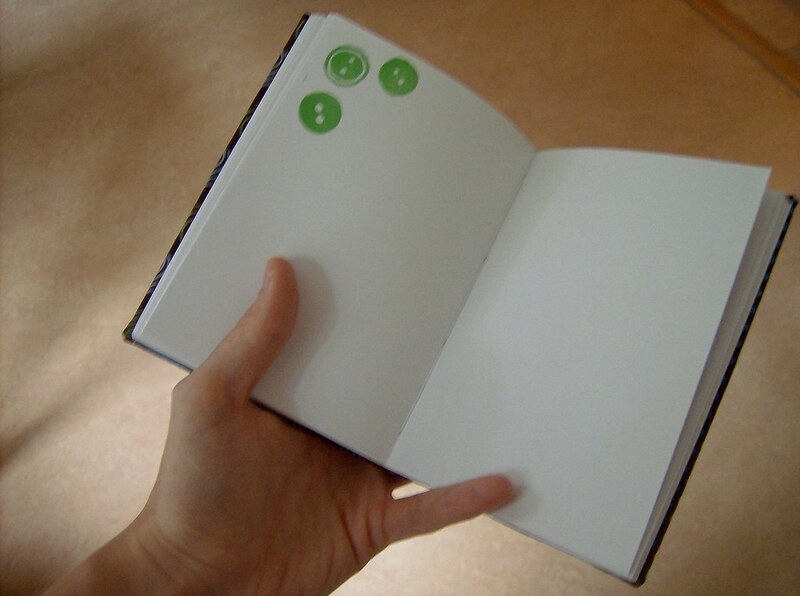 Since my partner likes to sew, I stamped some of the pages with a handmade button stamp. 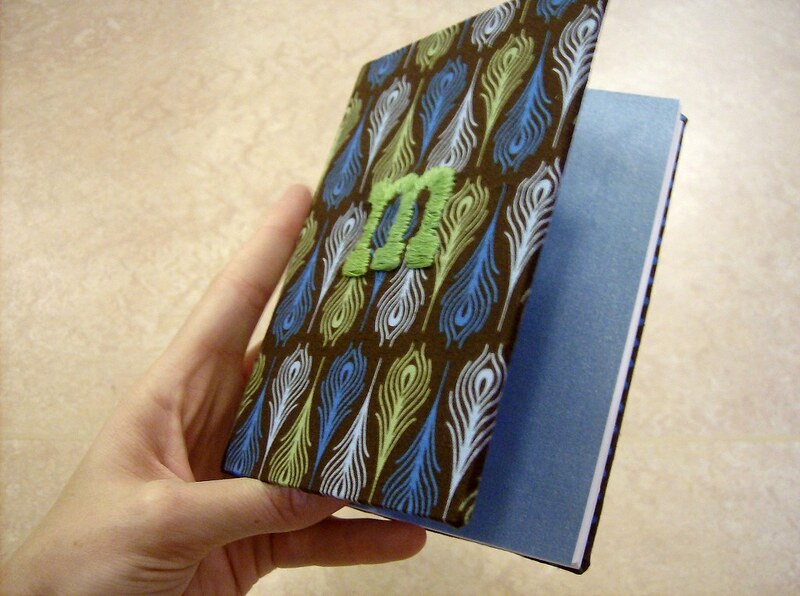 I'm excited to try binding journals again, and I'm thinking about making a couple more journals as Christmas gifts. I think it would be fun to personalize them with different colors, applique and embroidery. I recently started planning out my hand made Christmas gifts, hoping to get some more done in advance and not have the usual last-minute scramble. Do you have any fun gift ideas? Hi Karin. What a beautiful journal. Can't wait to see what else you make for Christmas gifts. Thanks for your link and you did a wonderful job. I am currently working on ( and by working on I mean, thinking about how I will do it) my own journal. So this is just enough of a push to get me moving on it. Jättefint! Jag skulle också vilja prova på att binda egna böcker, men det har inte blivit av än. Men det kommer, det är jag rätt säker på! 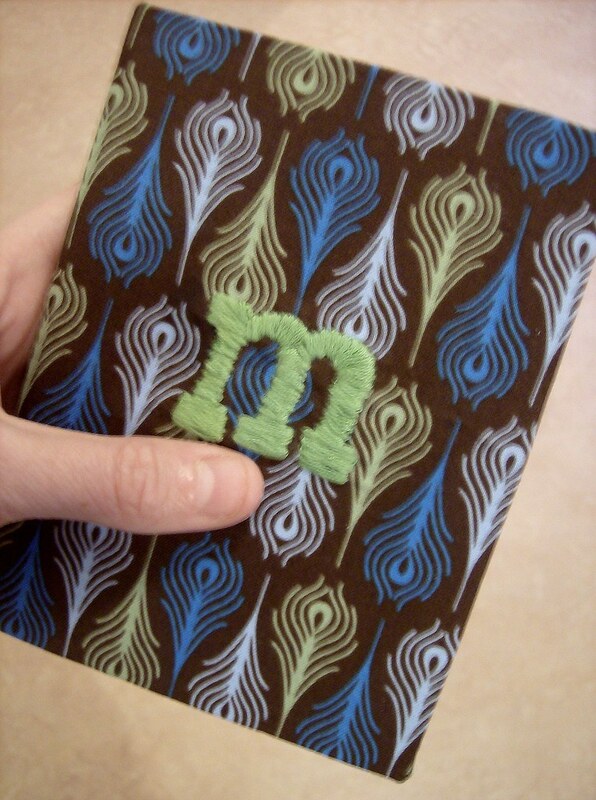 this is a lovely journal--very thoughtfully made! I love the colors you chose. They go very well together. I'm sure your swap partner loved it... I know I would.